At the sours blind tasting we held as part of WA Beer Week in 2018, it was fascinating to see where different attendees' preferences lay, from those who enjoyed those of a hoppy and low acidity bent to those who were all over the fruit and others that were looking for the funk. 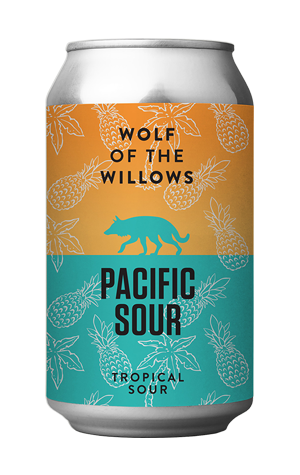 And, with this new "tropical sour", the Wolf Of The Willows team almost appear to be attempting to cover all bases, melding the yeast they feature in their Acidulus range with pineapple, guava and mango juices as well as Vic Secret hops. It might come as some surprise then that, for all the pineapples and palm trees on its skin, it's the the sour – a musty, dank funk – that rises from the cloudy pale liquid at first. You initially encounter the beer's tropical side on the palate, where young pineapple, mango and tart citrus characters are to the fore, while there's a sprightliness to its texture too. Give it time in the glass, however, and the fruitiness builds on the aroma too, creating a beer with something for those who favour fruit, funk or a bit of both in their sours.